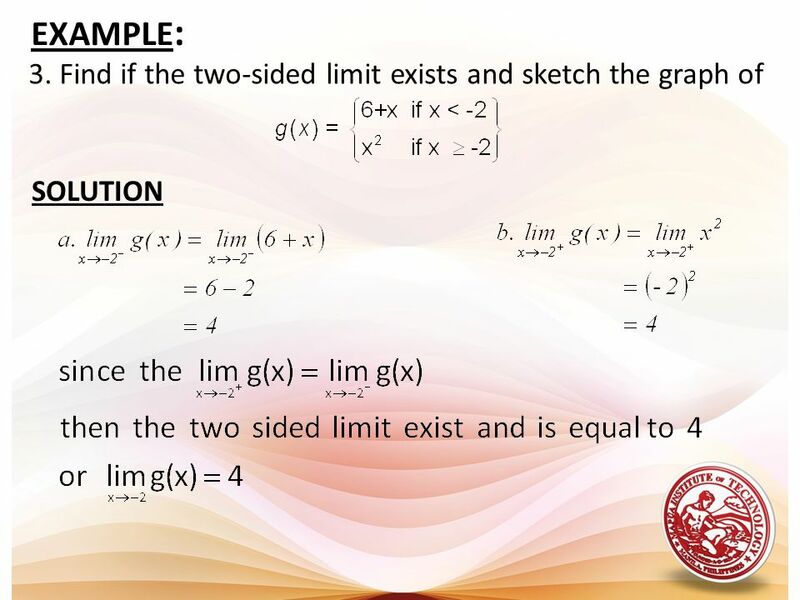 illustrate limits and its theorems; and evaluate limits applying the given theorems. 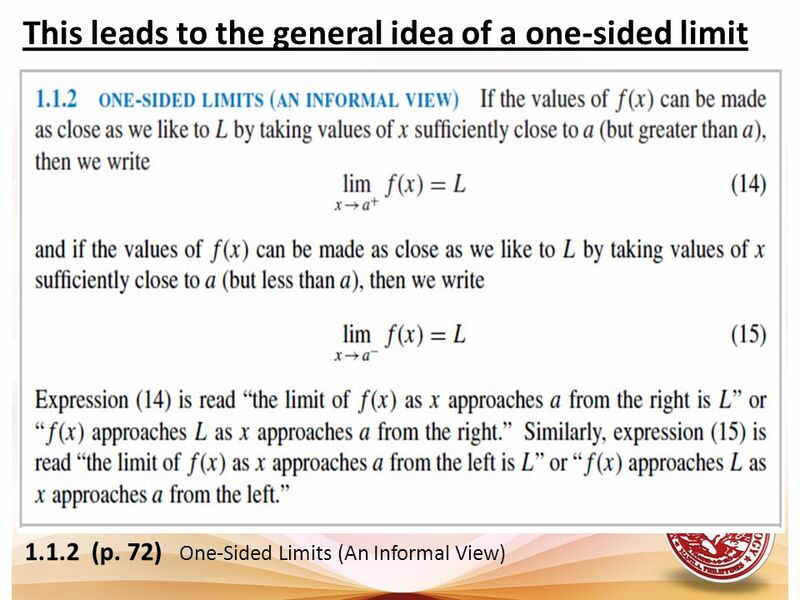 define one-sided limits illustrate one-sided limits investigate the limit if it exist or not using the concept of one-sided limits. 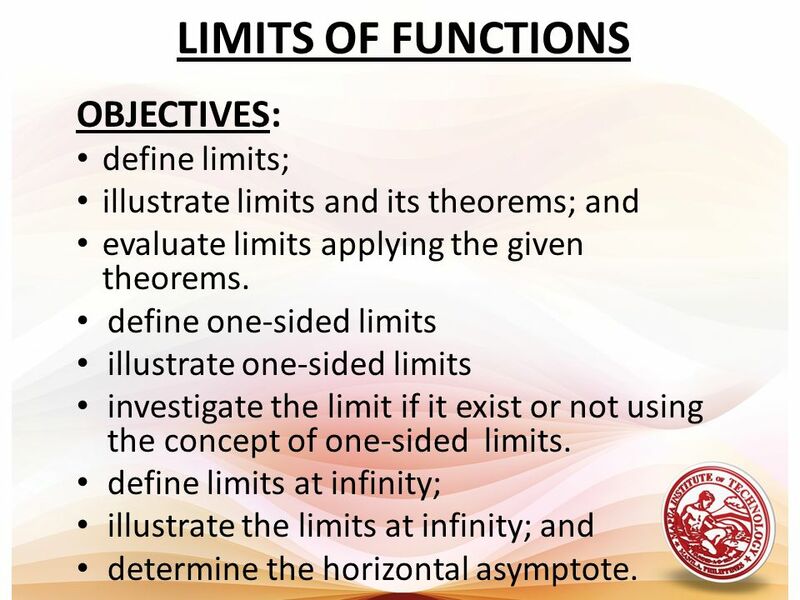 define limits at infinity; illustrate the limits at infinity; and determine the horizontal asymptote. 5 This leads us to the following general idea. 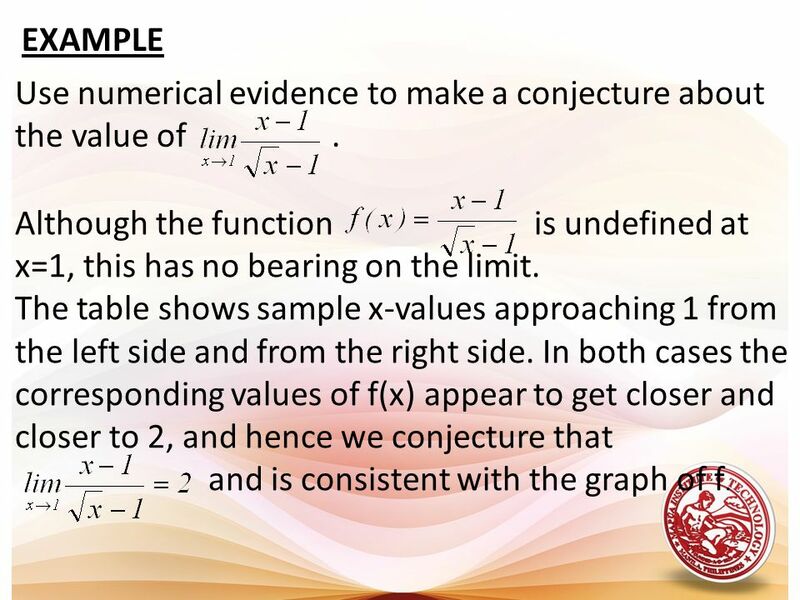 6 EXAMPLE Use numerical evidence to make a conjecture about the value of Although the function is undefined at x=1, this has no bearing on the limit. 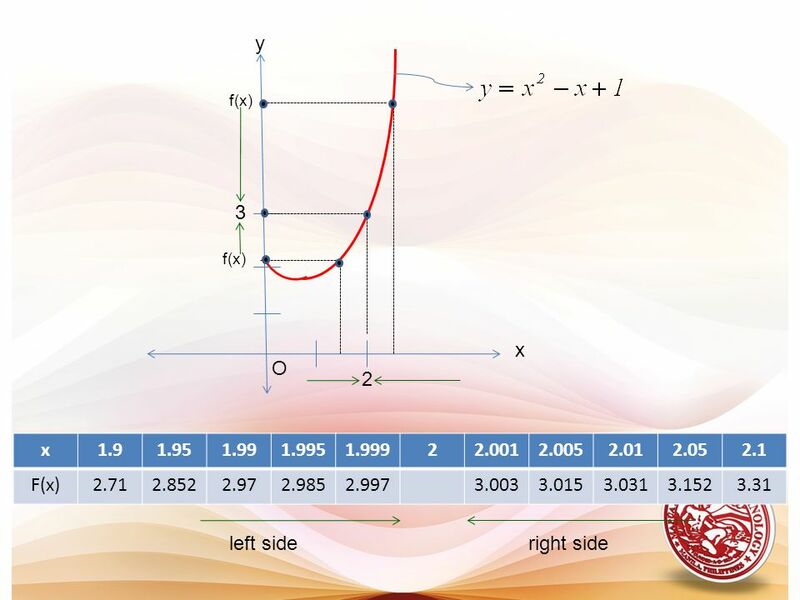 The table shows sample x-values approaching 1 from the left side and from the right side. 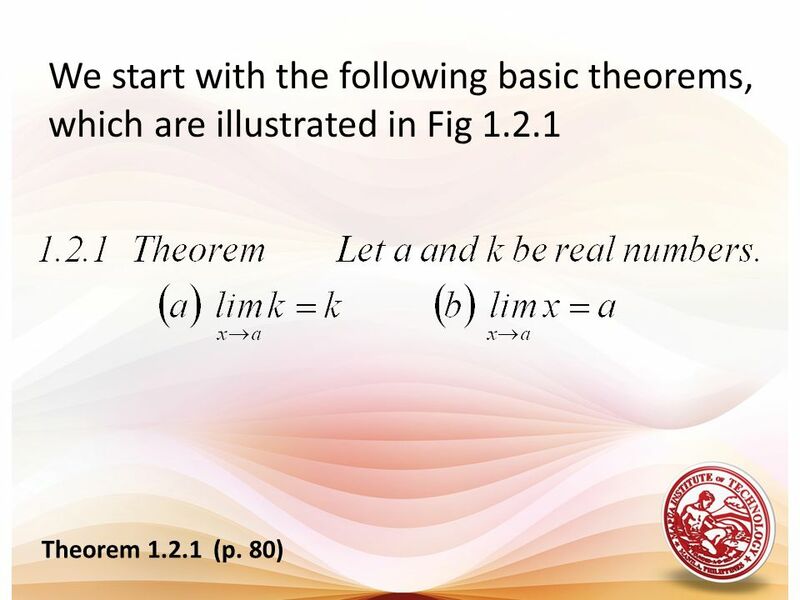 In both cases the corresponding values of f(x) appear to get closer and closer to 2, and hence we conjecture that and is consistent with the graph of f.
8 THEOREMS ON LIMITS Our strategy for finding limits algebraically has two parts: First we will obtain the limits of some simpler function Then we will develop a list of theorems that will enable us to use the limits of simple functions as building blocks for finding limits of more complicated functions. 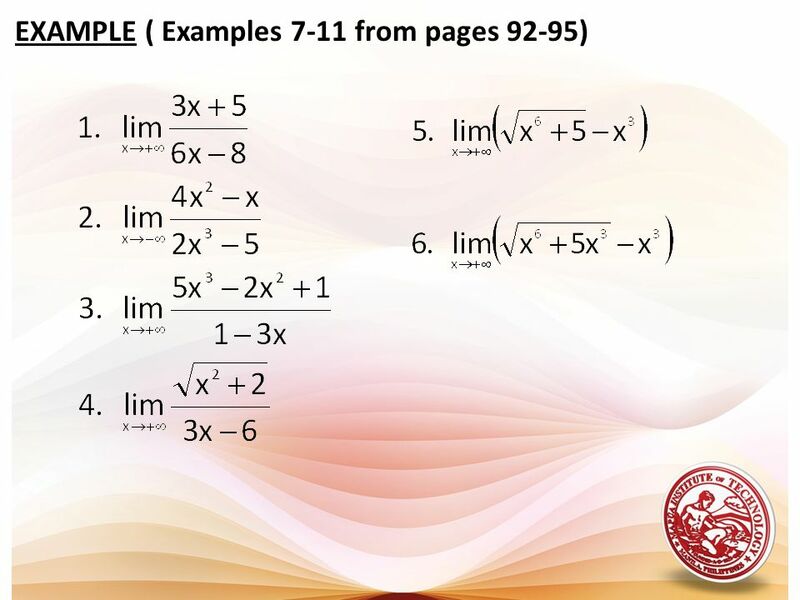 11 Example 1. 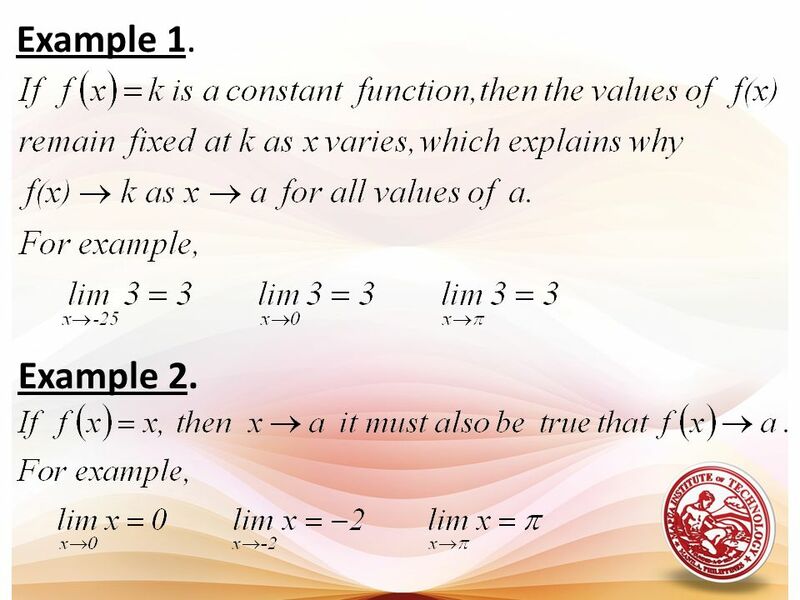 Example 2. 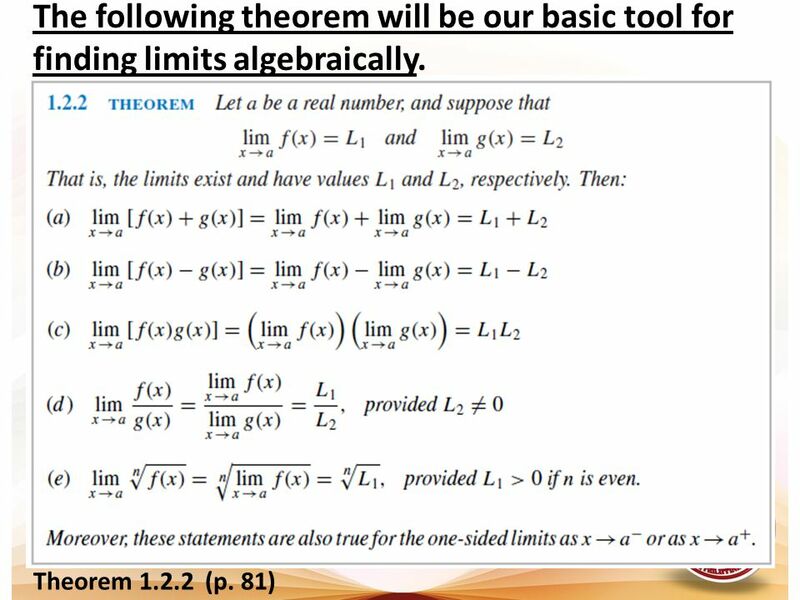 12 The following theorem will be our basic tool for finding limits algebraically. 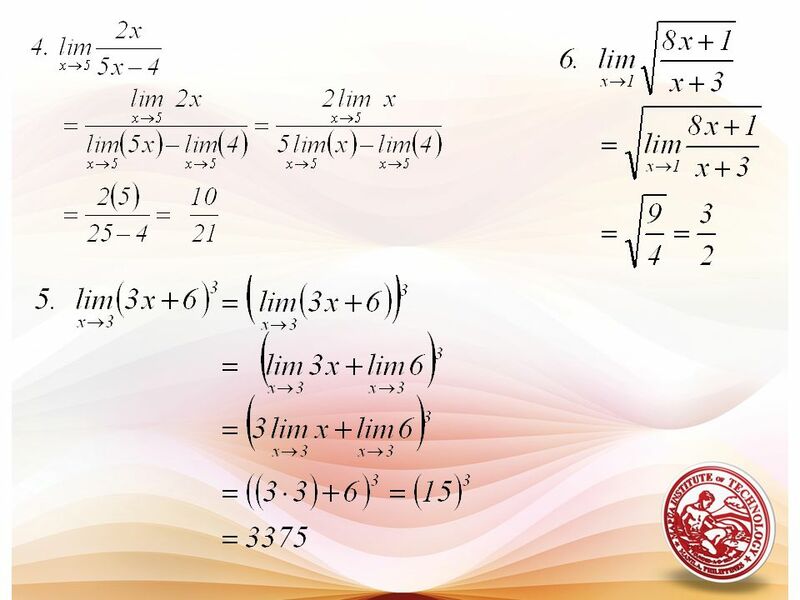 The limit of a sum is the sum of the limits. 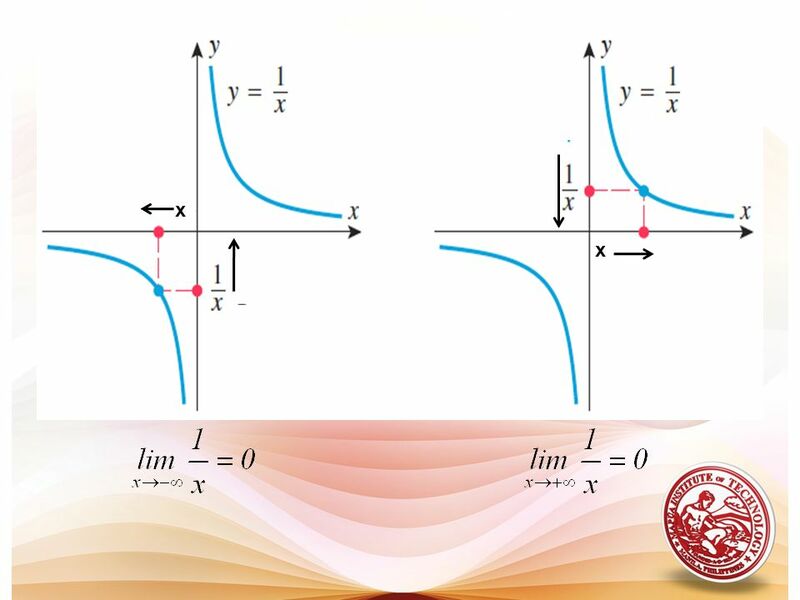 The limit of a difference is the difference of the limits. 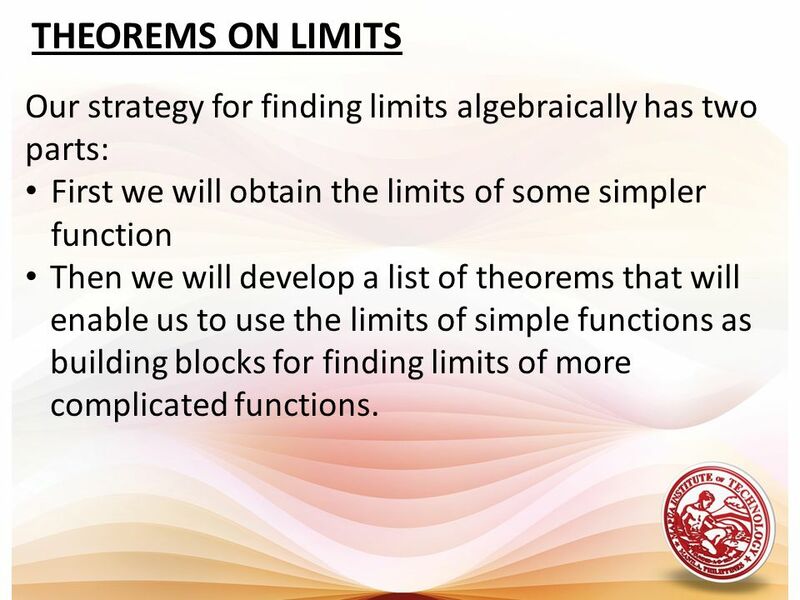 The limits of a product is the product of the limits. 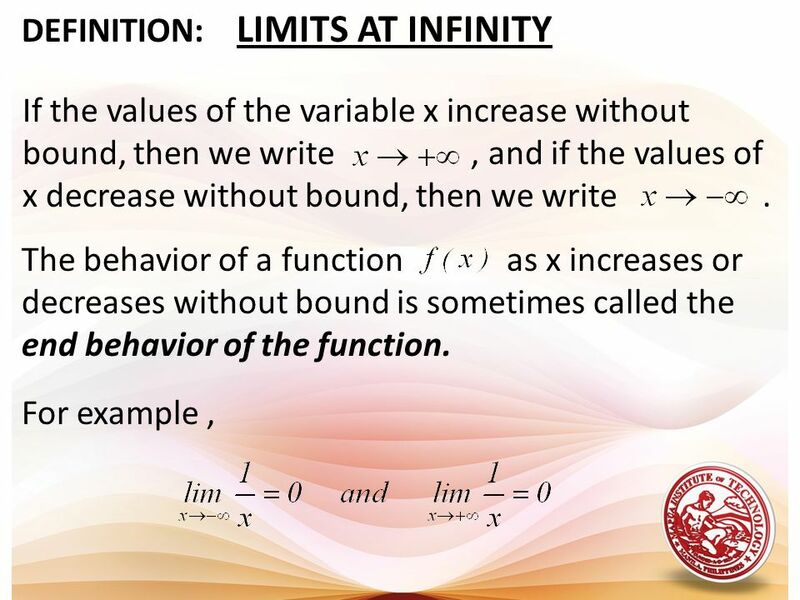 The limits of a quotient is the quotient of the limits, provided the limit of the denominator is not zero. 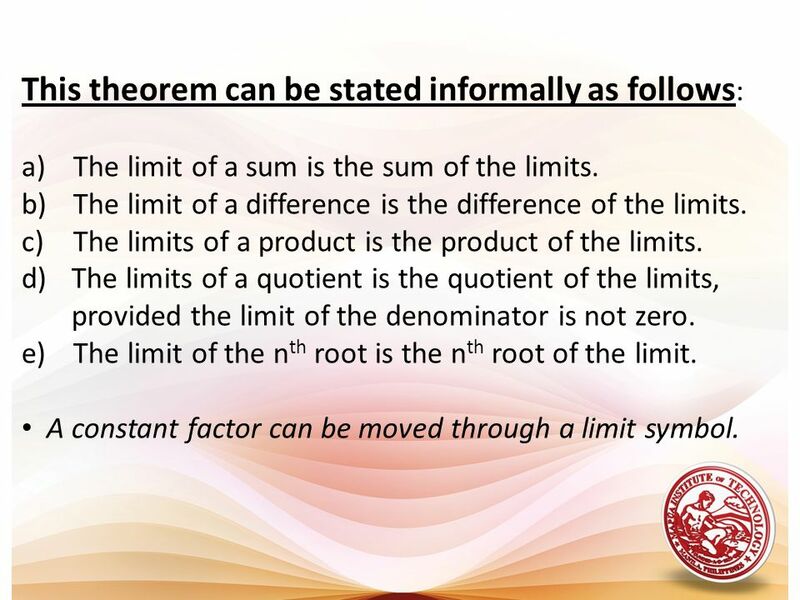 The limit of the nth root is the nth root of the limit. 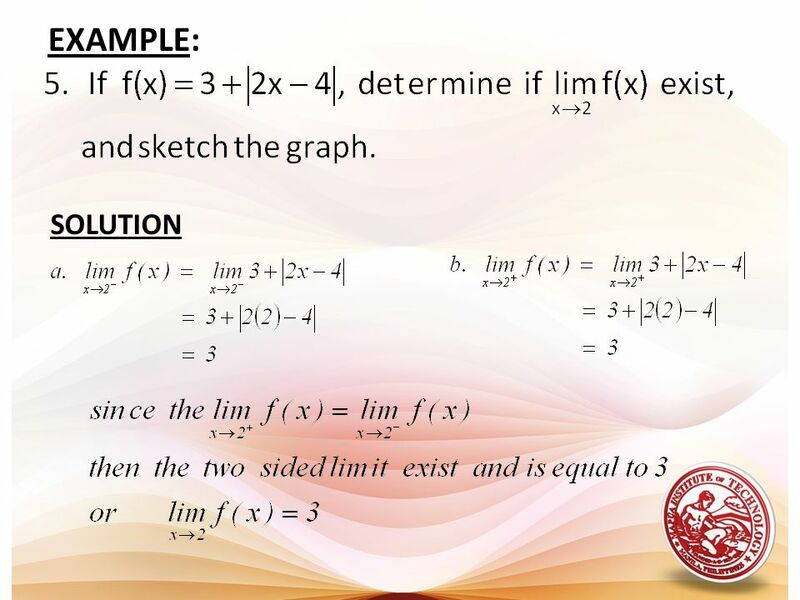 A constant factor can be moved through a limit symbol. 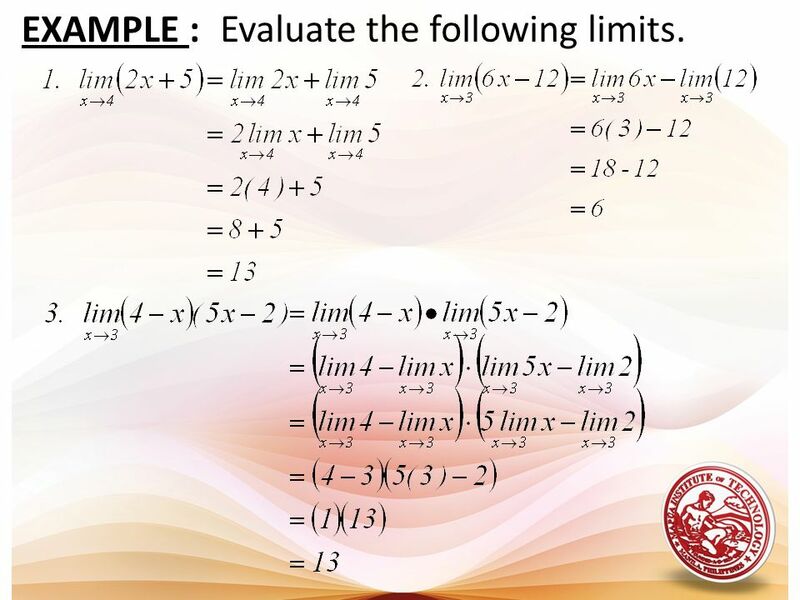 14 EXAMPLE : Evaluate the following limits. 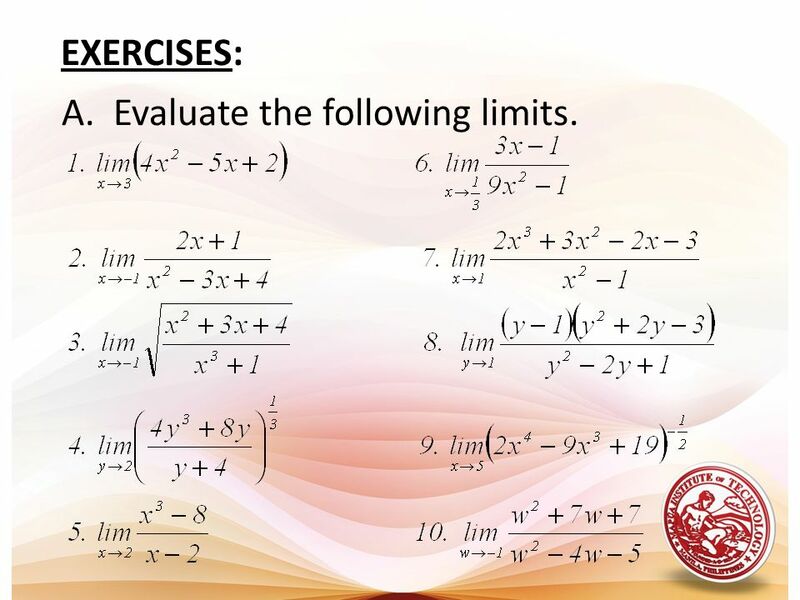 17 Evaluate the following limits. 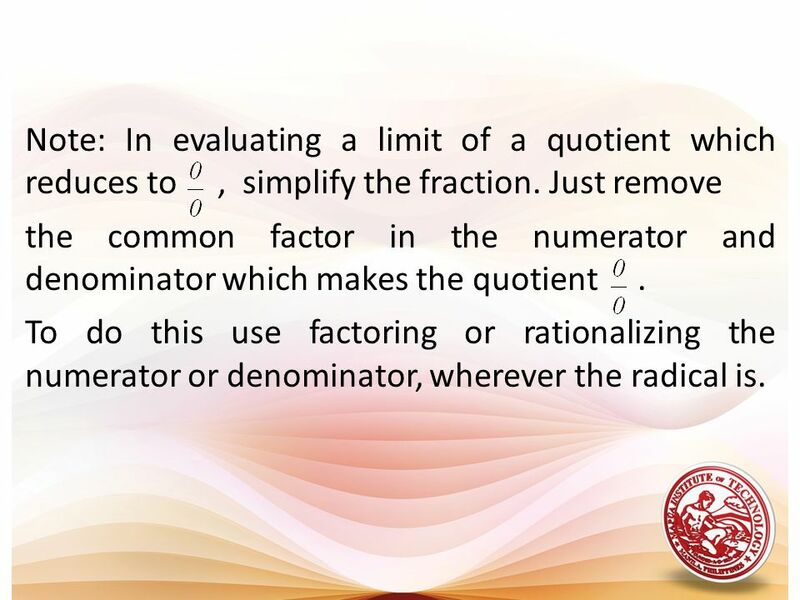 the common factor in the numerator and denominator which makes the quotient . 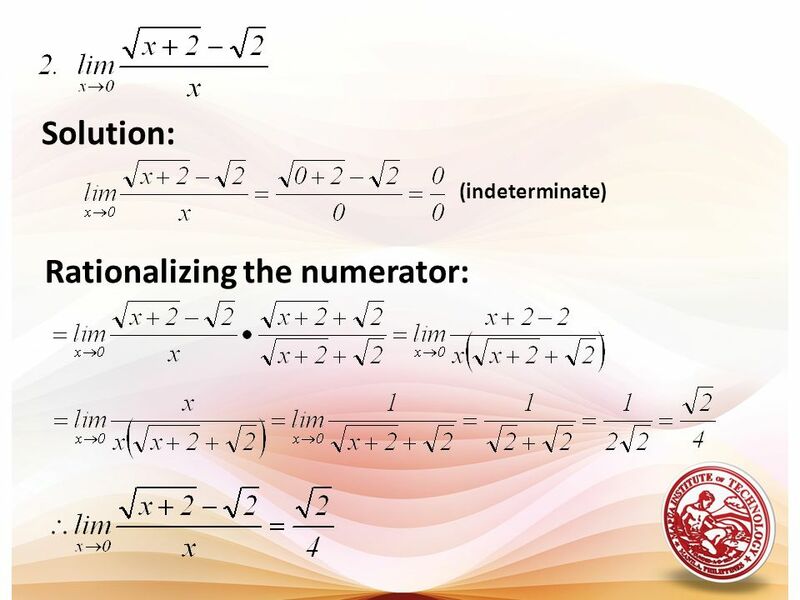 To do this use factoring or rationalizing the numerator or denominator, wherever the radical is. 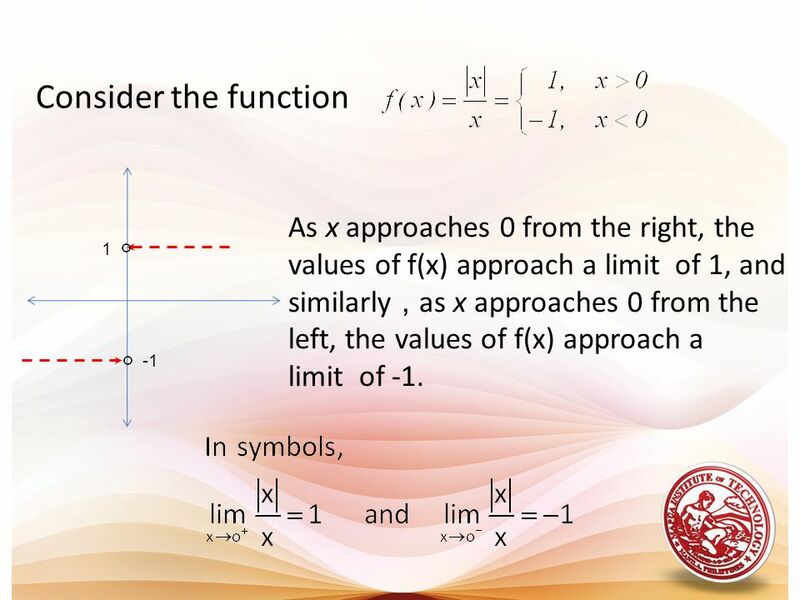 The limit of a function is called two-sided limit if it requires the values of f(x) to get closer and closer to a number as the values of x are taken from either side of x=a. 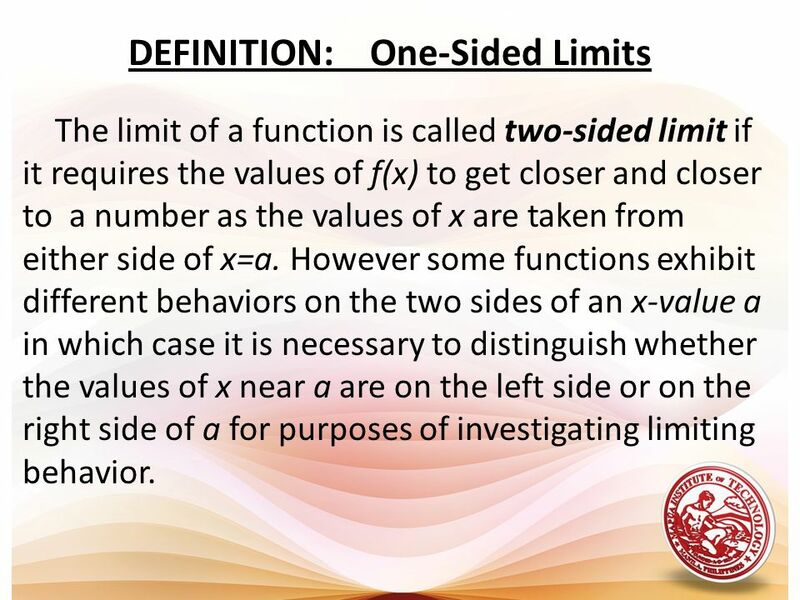 However some functions exhibit different behaviors on the two sides of an x-value a in which case it is necessary to distinguish whether the values of x near a are on the left side or on the right side of a for purposes of investigating limiting behavior. 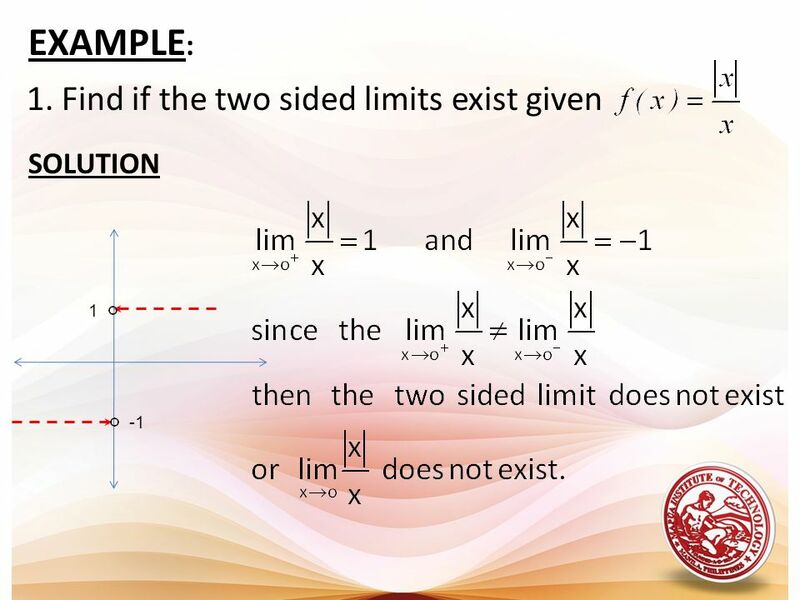 limit and the two-sided limits at x=a if they exists. 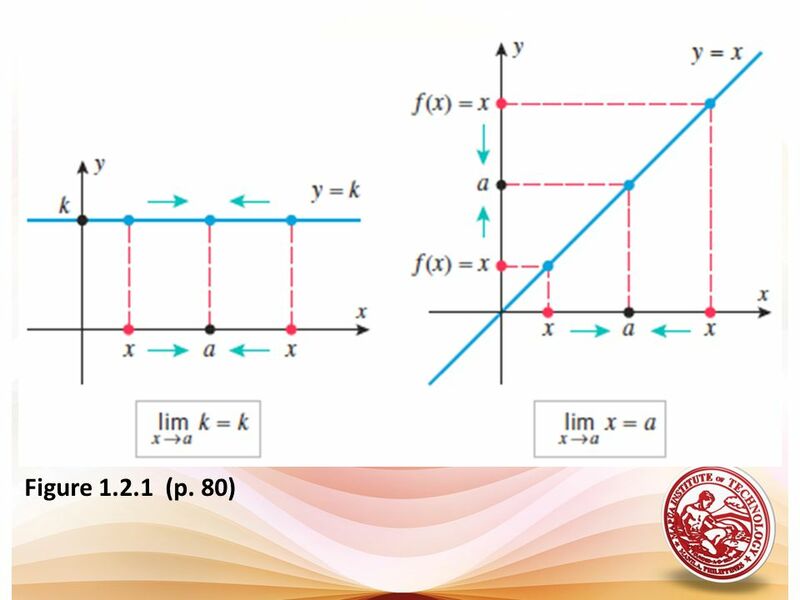 SOLUTION The functions in all three figures have the same one-sided limits as , since the functions are Identical, except at x=a. 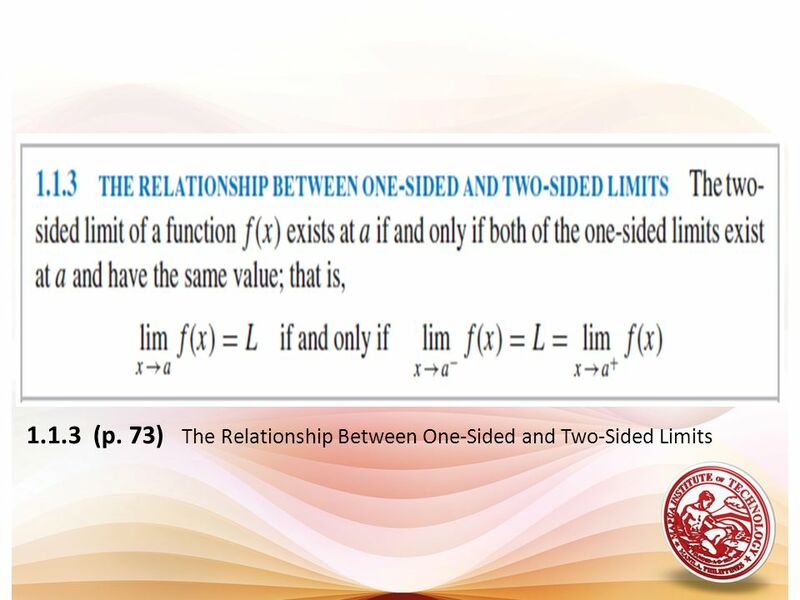 In all three cases the two-sided limit does not exist as because the one sided limits are not equal. 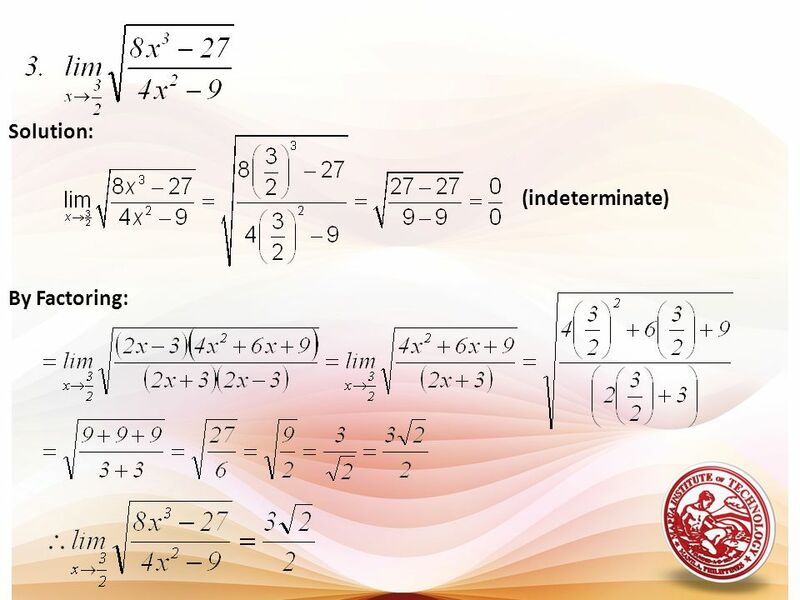 36 In general, we will use the following notation. 40 EXERCISES: A. 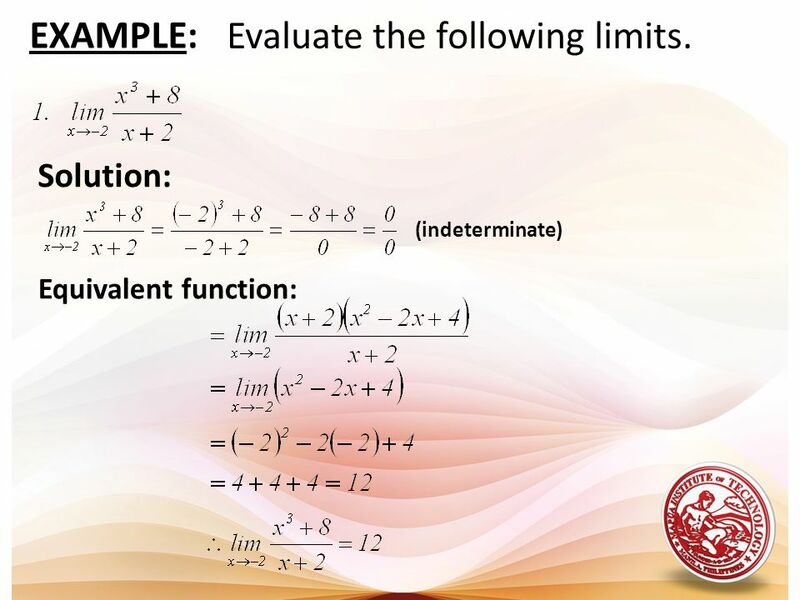 Evaluate the following limits. 41 EXERCISES: B. 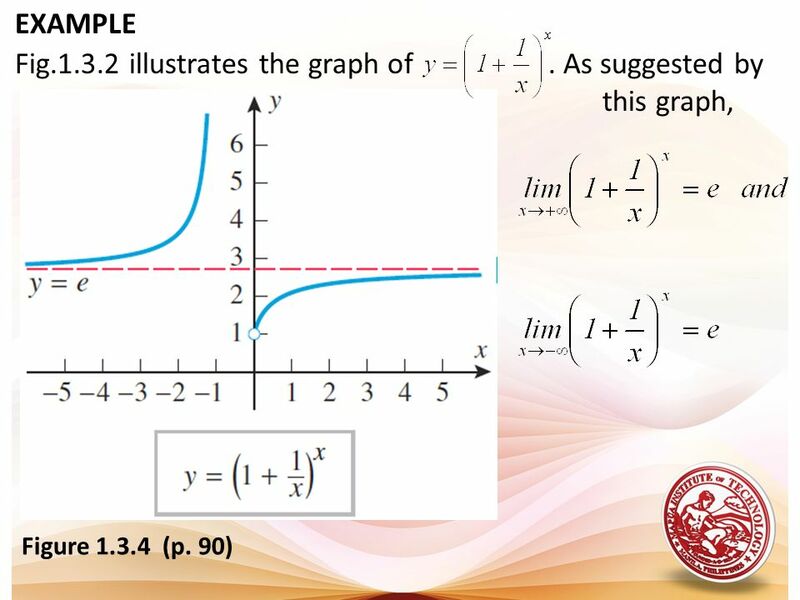 Sketch the graph of the following functions and the indicated limit if it exists. find . 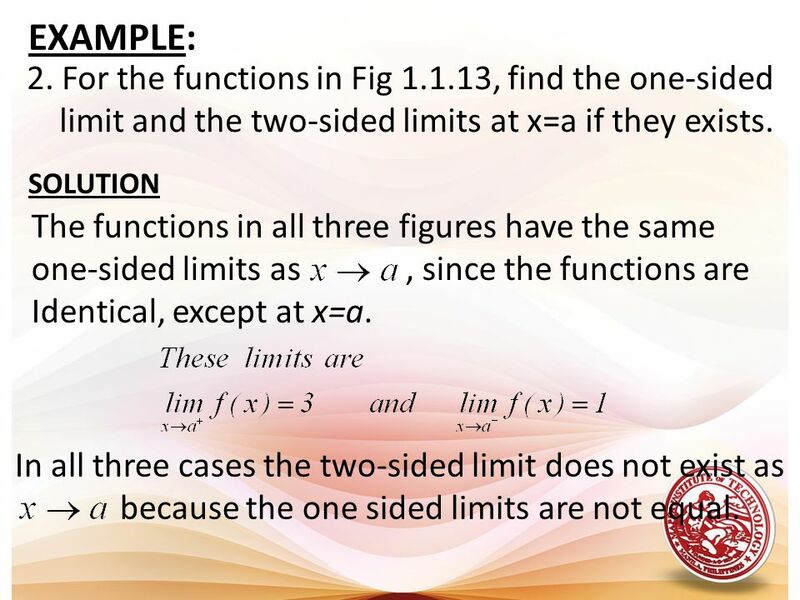 Download ppt "LIMITS OF FUNCTIONS." 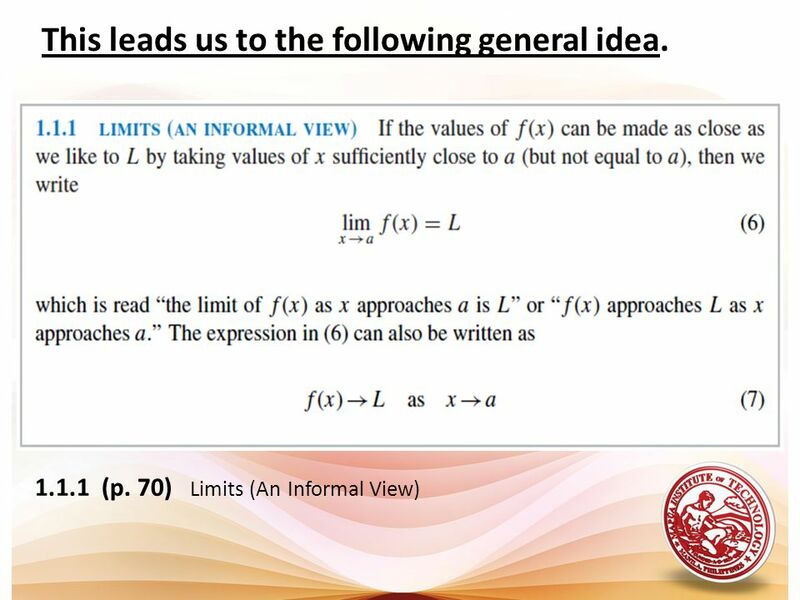 Goldstein/Schneider/Lay/Asmar, CALCULUS AND ITS APPLICATIONS, 11e – Slide 1 of 115 § 1.4 Limits and the Derivative. 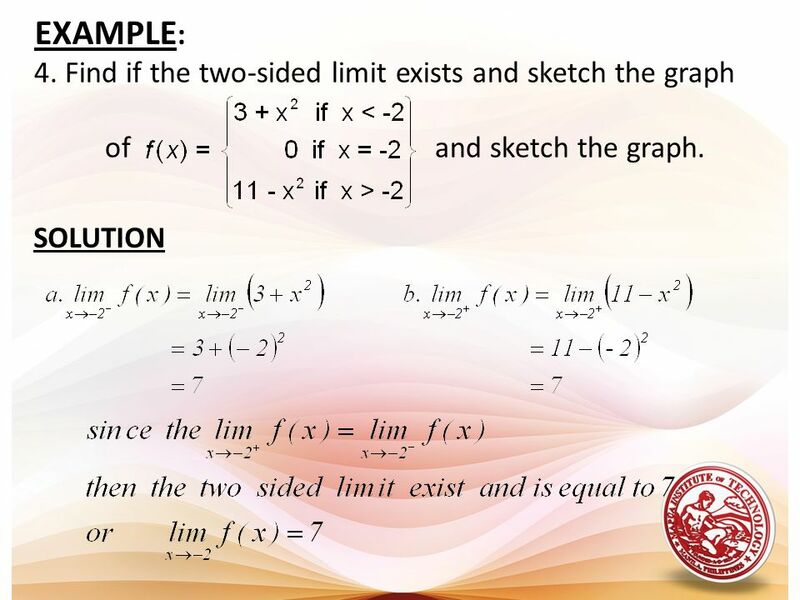 1 Finding Limits Graphically & Numerically Section 1.2. 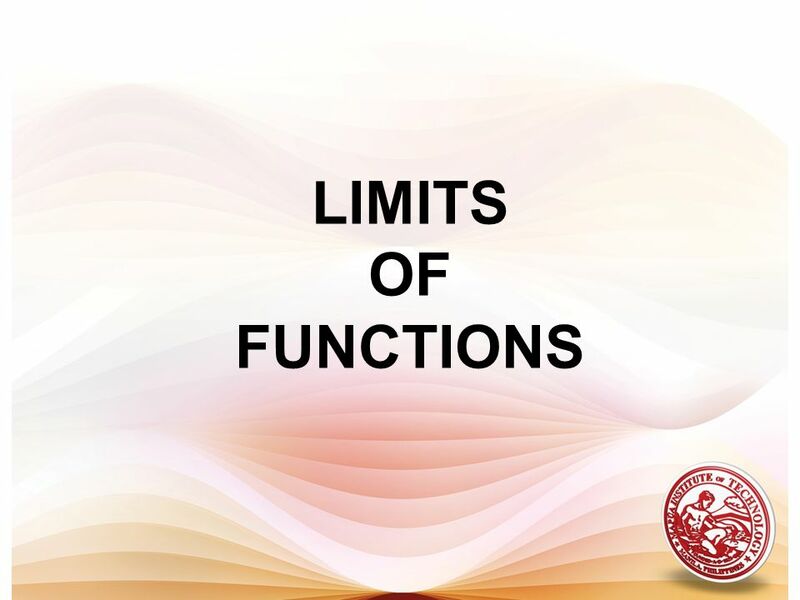 LIMITS The Limit of a Function LIMITS In this section, we will learn: About limits in general and about numerical and graphical methods for computing. 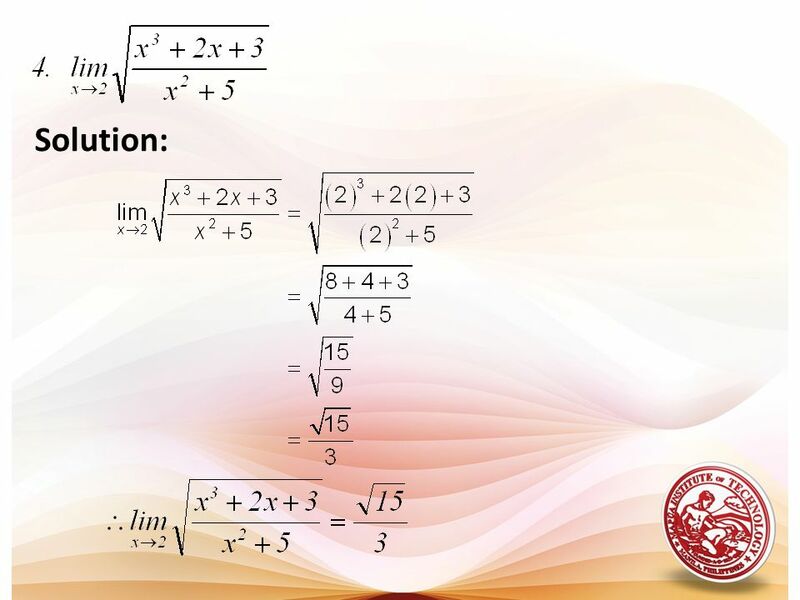 APPLICATIONS OF DIFFERENTIATION 4. 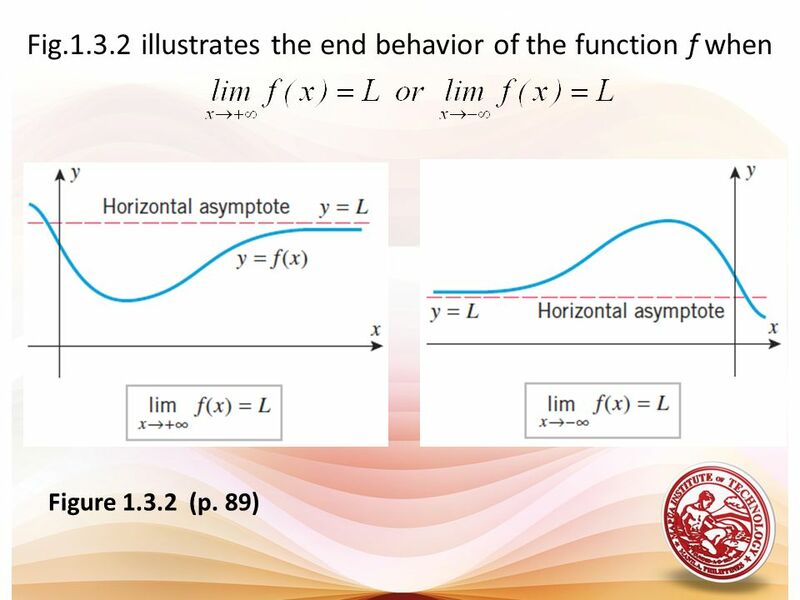 In Sections 2.2 and 2.4, we investigated infinite limits and vertical asymptotes. 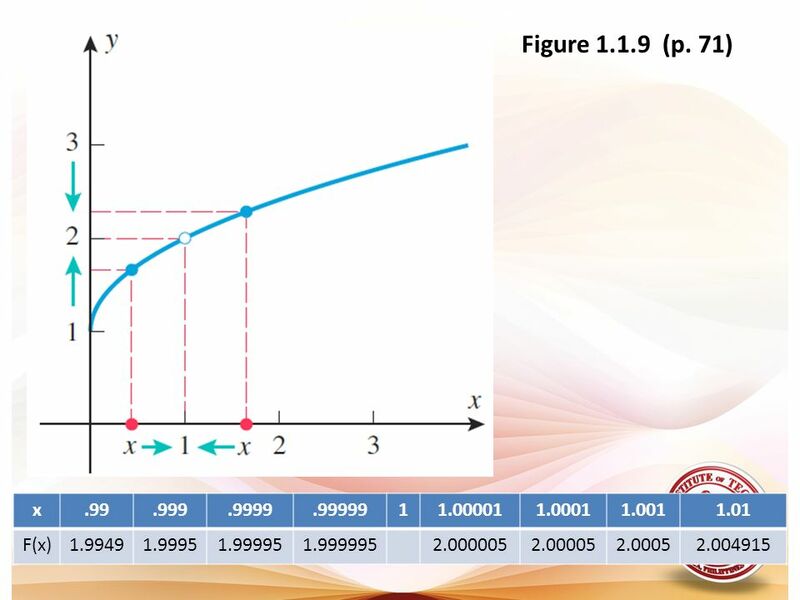  There, we let x approach a number. 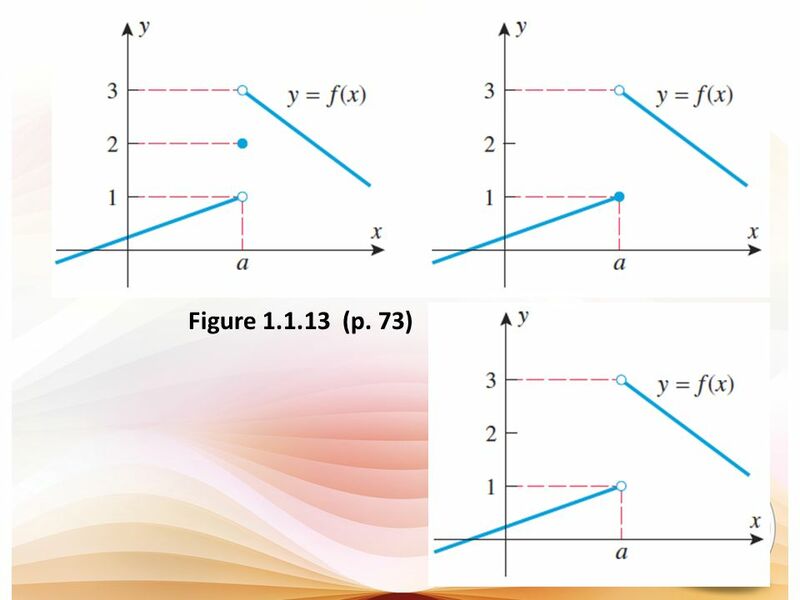 Rational Functions and Their Graphs. 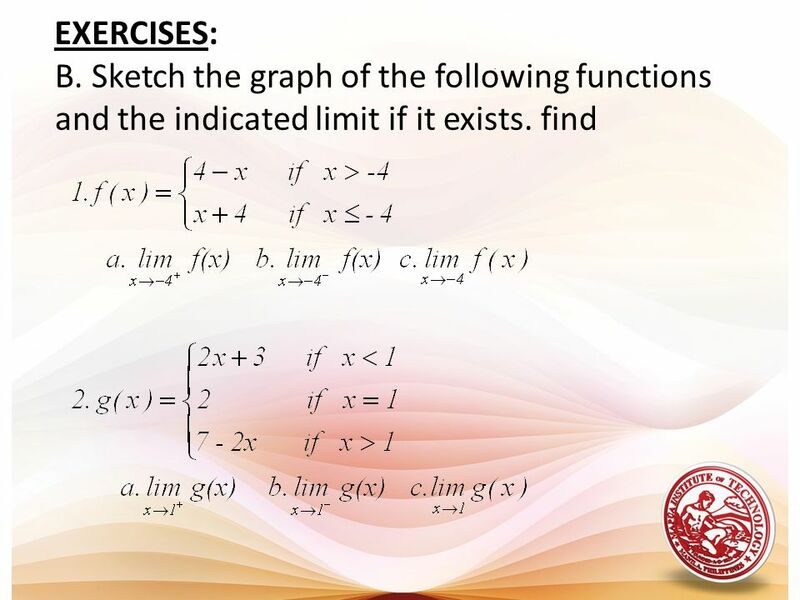 Example Find the Domain of this Function. 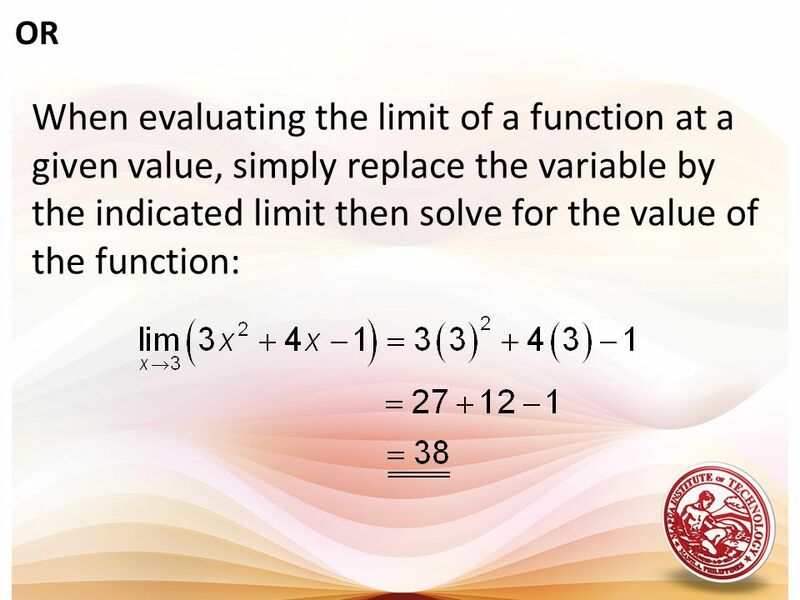 Solution: The domain of this function is the set of all real numbers not. 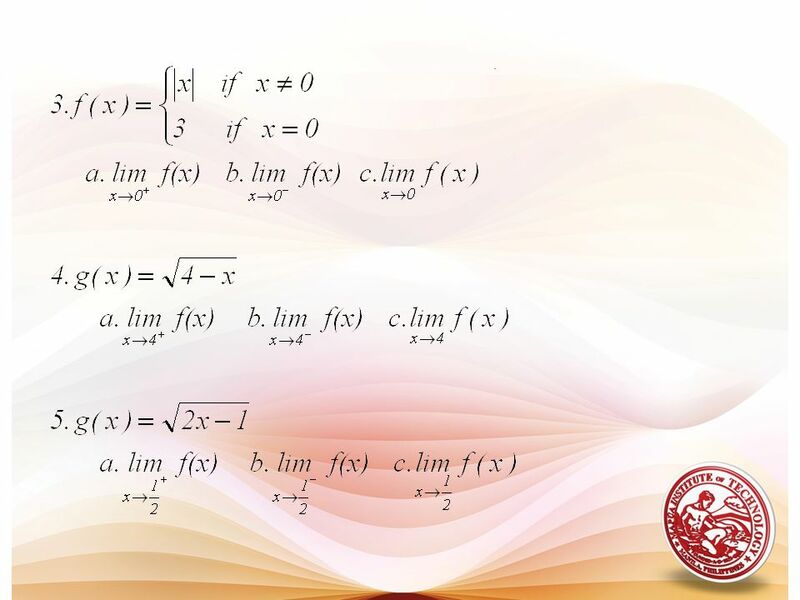 1 Find the domains of rational functions. Find the vertical and horizontal asymptotes of graphs of rational functions. 2.6 What You Should Learn. 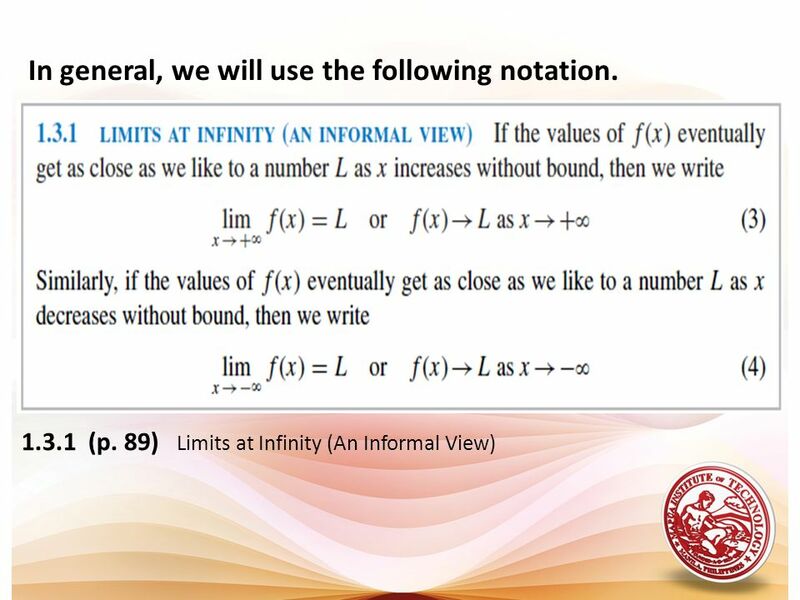 CHAPTER 2 LIMITS AND DERIVATIVES. 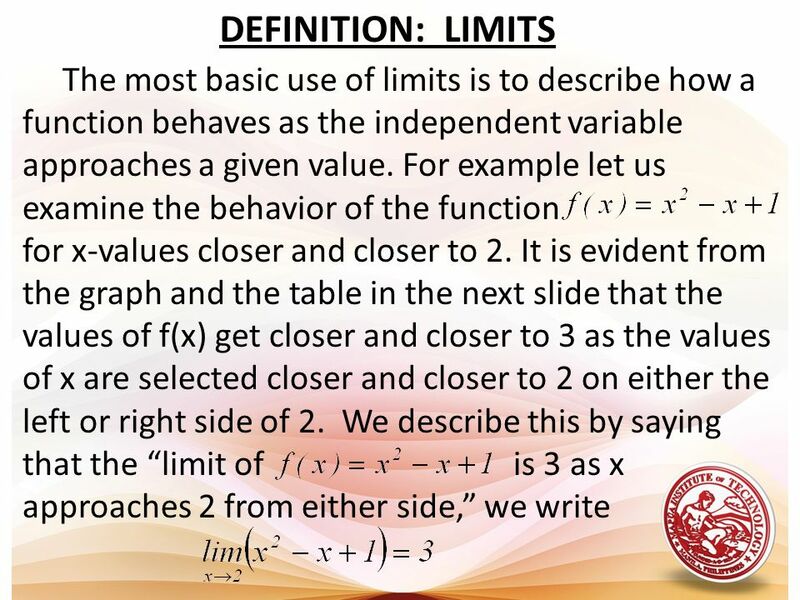 2.2 The Limit of a Function LIMITS AND DERIVATIVES In this section, we will learn: About limits in general and about. Copyright © Cengage Learning. All rights reserved. 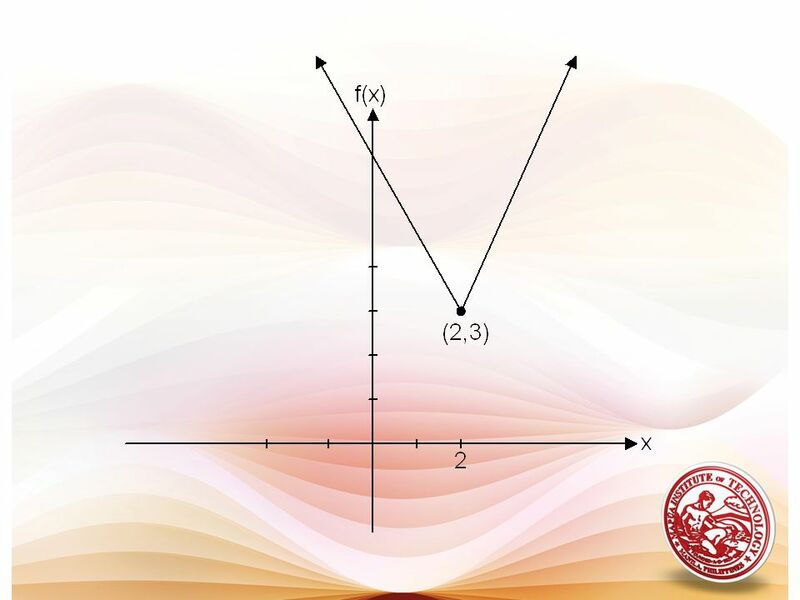 1 Functions and Their Graphs.